7, was shot dead by police on Wednesday in Florida after attempting to drive over officers in a vehicle that was believed to have been stolen. A teenager was shot dead after attempting to drive police and spectators over in a stolen vehicle that drove through a crowd of around 200 people in Florida on early Wednesday morning. The police described this as a "chaotic scene." The suspect, 17, reportedly stole a black Camaro in Winter Haven and tried to escape when he saw officers approach the vehicle, Tampa's WFLA TV reported. Police in Lakeland, about 35 miles east of Tampa then responded to a call at 2:21 am because of a large crowd gathering outside a restaurant, the report said. As the Camaro accelerated directly toward Lakeland Officer Markais Neal, 28, he shot at the vehicle, police said. Joseph Novis, 25, and Raj Patel, 23, also fired at the car to stop it, the station reported. "The driver ignored that and drove through the parking lot at high speed. Several vehicles in the parking lot, a light pole, and he finally rammed into a parked vehicle and pushed it into a bicycle barn," said Giddens. "He hit the car with one such a blow that it hit this vehicle through a block wall, causing the airbag to be triggered. " 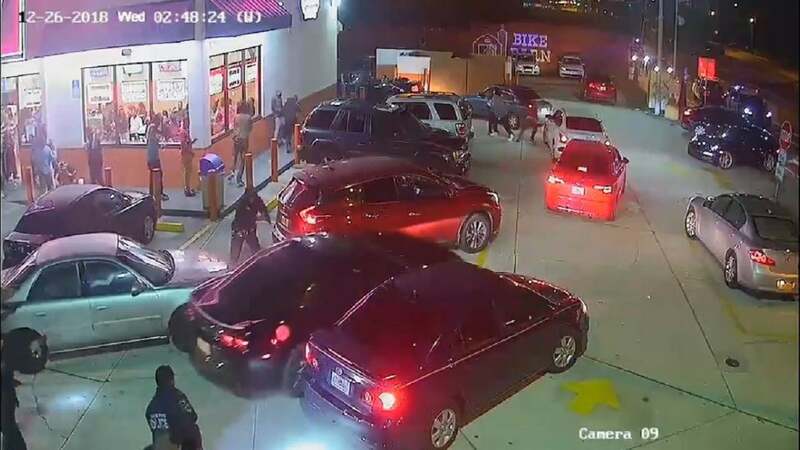 The police released a surveillance video in which the officers open fire on the driver it in the First Aid report was taken to a Lakeland hospital where he died. It was not clear how often the suspect was shot or how many rounds the officer had fired, the North West Florida Daily News reported citing a release. The teen The Tampa Bay Times reported that they had previously arrested four people for theft and theft. A passenger was in the stolen vehicle, but could jump out of the car before the crash, the WFLA reported in police custody and later the police were told that there may have been a gun in the Camaro, after which the gun was under the floor slab the car was found, the station reported. All three involved officers were on leave for a paid official leave, according to the protocols, at least three days after the police officer who was involved with the police.